Come on down and watch the Cystic Fibrosis Crusaders Charity Cricket Match! 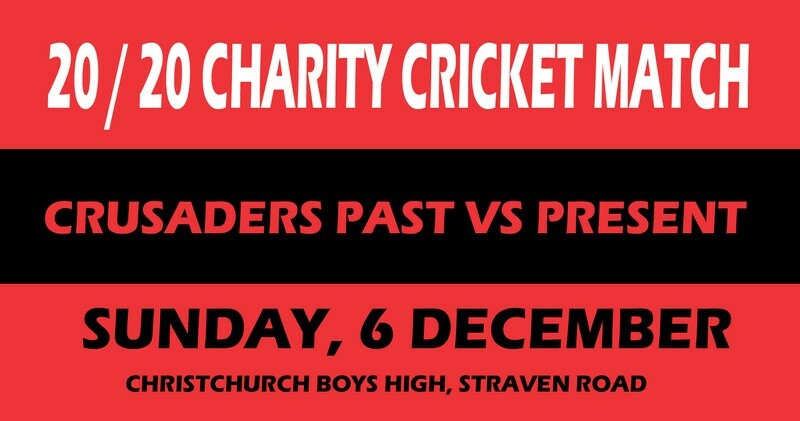 Watch the Crusaders Heros from the Past take on the Present Crusaders to battle it out for victory! Bring your family and a picnic and meet the boys in Red and Black to get a selfie and their autographs. Then take a short walk down the road to the Santa Parade after lunch! Free family fun activities including a sports area with the Crusaders, segways, bouncy castle and face painting. Live half time auction with sports memorabilia, beauty hampers and massage vouchers- just in time for Christmas! And a Balloon Raffle where everyone wins a prize! All proceeds from this event will go towards helping families living with Cystic Fibrosis in our community.